Beautiful but deadly: this photo was taken from the tee of this hole. Yes, you actually have to go over that lake. On occasion, I have been known to play golf. Generally badly. Last Saturday, I headed down to the Farringdon 3-par course with some friends to go and test our luck – both with the weather and on the links. After a few holes, we confirmed the long-held suspicion that golf was an abusive partner. For a while, there’s a honeymoon period where everything is great. You’re swept up in the confidence inspired by the experience not being as you feared. Then, when you’re least expecting it, golf takes a chunk out of you. Let me give you an example. Having got off to a slightly ropey start, I made it to the third hole. At this point, you’re teeing off from higher than the green, and you need to sail your ball over a lake. Having hit a few good, straight shots, I visualised the ball landing on the green in anticipation of a thumping shot. Said shot turned into a 45-degree anomaly, leaping part of the lake but landing firmly on a peninsular. Second shot at getting over the lake, the ball sailed wildly over the green, settling under a small pine tree the far side of a bank. Taking a slightly flippant swing at the ball with my pitching wedge (and, as I recall, shouting ‘This one for par’) I lobbed the ball onto the green and damn near got it in. Putting in four, after what was a fairly disastrous sequence of shots, I felt that I had the game mastered. Come the next hole, I was brutalised by short shots, thwacking the ball out of a clump of daffodils, and a farcical catalogue of nearly-but-not-quite shots with the putter. Golf was reminding me who was boss. But does anyone – apart from really good golfers – win from golf? We got talking to the club pro, who owns the course, about the miserable weather so far this year. It turns out, Farringdon Golf Course is up for sale. What follows is pure speculation and conjecture, and shouldn’t be relied on for any form of financial advice. But can a relatively low-key golf course actually make good money? 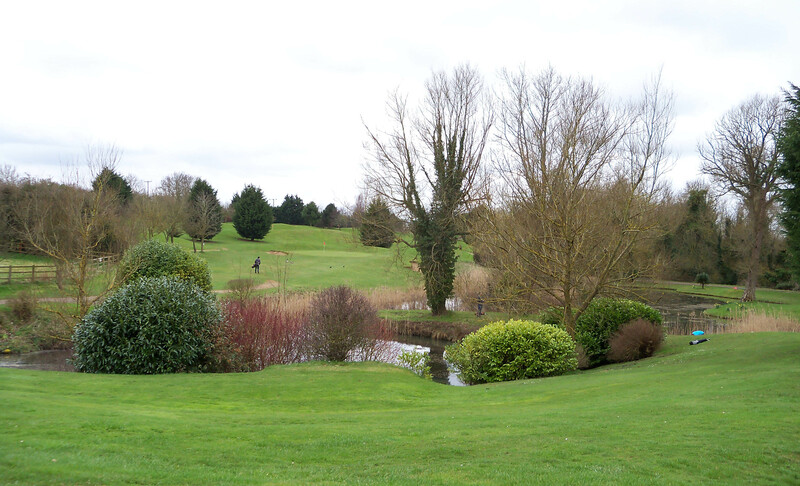 Oxfordshire, and the surrounding counties, have a lot of golf courses. Some of which are remarkably popular and well funded. Others – and without wanting to generalise, often the public ones – are less popular, but equally well maintained. However, with so many golf courses to choose from, there’s inevitably a downward pressure on green fees as a result of simply supply-and-demand economics. Farringdon currently charges £10 for a whole day of unlimited golfing. The course has an annual turnover (i.e. money coming into the business, irrespective of the amount of money going out of the business) of £150,000 per annum. The asking price for the freehold of the golf course is £950,000. While there is potential for clearing planning permission to upscale the clubhouse, build residential property, etc., all this would require additional investment beyond the outlay to purchase the freehold. So, we’ll base this all on the business as it currently stands. If you’re going to look at buying – or starting up – a business, you need to look at your cash flow projections. A cash flow is, simply enough, the flow of money in and out of a business; it helps to identify potential crunch points where a business needs capital sitting around for emergencies, or to pre-empt the kind of event that might lead to further debt or closure. You can’t run a golf course on your own, so you’ll need to employ someone. Let’s say you’re not paying them over the odds, but that the rounded wage figure includes National Insurance and other overheads an employer needs to pay. £18,000 per annum should do it. Maintenance of the course is time-consuming and expensive. It has to be tended year round. In the summer it needs watering. It needs aerating. It needs feeding. The grass needs reseeding each year. It needs mowing. Damage from use and water logging needs to be repaired. Let’s not forget the leasing costs for any equipment you decide not to purchase outright, or the cost of equipment you buy. £3000 per hole per annum should be a low-level estimate. Farringdon is a 9-hole course. Loan repayments. For this, we’ll assume you’ve got a 25-year mortgage deal at around 5% per annum. We’ll kind of skirt round the fact that this is precisely the kind of bank loan that’s nigh on impossible to get at the moment, and the likelihood of the loan needing to be repaid in closer to 10 years. Green fees. These are either paid as membership, or paid by casual players. These will fluctuate with the seasons, but you should expect to see the vast majority of these paid over the summer holidays between July and September when the weather is at its best and people tend to have time off work. Golf tuition. This is the most profitable part of the business because you’re charging for your time (assuming you’re a golf pro, of course) and able to charge whatever people will pay. Naturally, this works out more expensive for the customer than a simple round. Retail sales – golf balls, tees, drinks, sandwiches, snacks, etc. Let’s work on the assumption that these sales peak as the number of golfers peaks, and that you’re working on a 50% cost of sales (e.g. if it costs you £1 to buy a sandwich wholesale, you’ll charge customers £2). 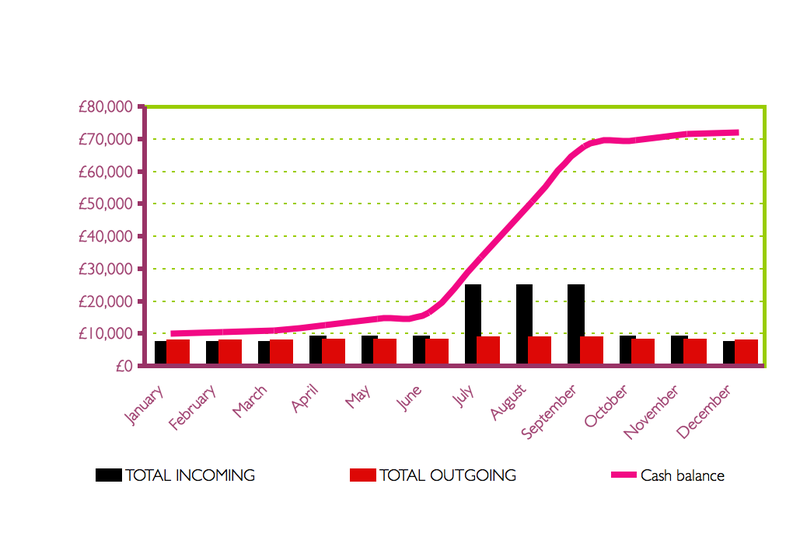 Great, so with a few added details, we can pull together a cash flow forecast for the business. It might even look something like the picture below. What you’ll notice about that diagram is that Farringdon should make a net profit of £60,000 a year, as the cash balance is money left in the business after bills. The first point to note is that for nearly a million pounds’ worth of risk invested against the golf course, that’s not a brilliant rate of return. The key thing to note is the months that aren’t summer. For four months a year, the club makes a loss. For five months of the year, it pretty much breaks even. It’s only in the three summer months that it makes a profit. There is also a key point we’ve brushed over: you. The chances are that you’ve set up this golf club as a sole trader, and so your finances are indistinguishable from those of your business. This cash flow assumes you won’t be drawing any kind of a wage, or incurring any kind of living cost. Seems unlikely, doesn’t it? Assuming you started the business in January, you would need to live off the cash balance of £10,000 until July. This model should also show you how susceptible this kind of business is to the weather. We’ve had a harsh winter – the worst for 31 years – and you can safely assume that the outgoing costs of the course in February wildly exceeded the money coming in. In these circumstances, where your revenues can fall off a cliff, and your total cash balance is little more than your monthly outgoings, you can find yourself in all sorts of trouble very quickly. If you wanted to bolster your cash flow, you would need to look at innovating with your business model. While the most popular clubs in the area can afford to wait for customers to come and part with their money, the smaller clubs need to start cutting themselves some new business in order to survive. If you ran Farringdon, you’d want something that would give you a cash injection during the winter months. Perhaps something as simple as selling gift-sized (6 month?) memberships or golf lessons (add in the cost of a professional-looking voucher and card, and it suddenly looks like a tangible gift) could make the difference. Similarly, a late winter competition to attract a reasonable number of golfers and take advantage of both the quiet season and the generally stable weather conditions, could provide some additional revenue. My point is that a lot of different people try to make their sport pay, but relatively few are really successful in doing so. Of course, it’s the same for all businesses – some swim, but most sink – but people building businesses around their sport should have a better chance of success because it’s their passion. If you’re passionate about something, you’ll give it that bit extra thought and effort. However, having walked past both branches of Run Oxford – a local running store – and consistently seen bored sales staff and no customers, perhaps sport-based businesses follow the general rule just as prescriptively. Their lack of trade isn’t for lack of demand, as the excellent Up And Running on Headington Road always seems to be doing good business, sponsoring local races, hosting events and acting as a community hub of information. There’s an ongoing conversation in trade publishing about vertical niches – which I won’t go into here – but it seems like this might be a conversation that applies to sport-based businesses too.